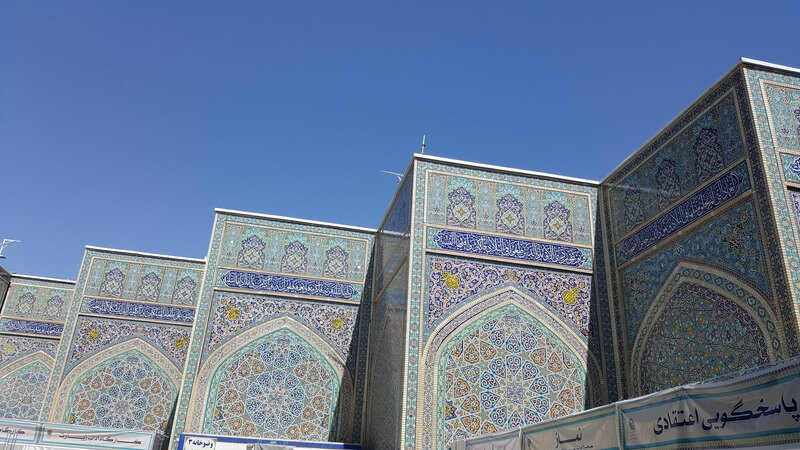 Shirvan - Mashhad - 2initineres Webseite! Our day off was very quiet; we did not move a lot and spent most of the time laying on our blanket in the park behind the hotel. On a day like this I often have a bad feeling because I do nothing…at least we went shopping. As we planned to leave at 6am the next morning, we bought bread, fruits, cheese and honey for a decent breakfast. The melody of the alarm clock woke us up at 5am. How nice it would have been to turn around in bed again, but we did not want to bike in the heat. Soon were ready to leave and the bikes were packed. Once more we realized how beatifull it is to ride in the freshness of the morning and to experience the “wake up” of the day. The landscape in the morning sun is even more intensive, all smells fresh, except for the pollution coming out of the old trucks, leaving at huge dark cloud behind them! The ride lead us through a large and very dry valley, surrounded by two huge mountain ranges on the right and the left side. We reached Quchan already before lunch and were surprised to find an apartment instead of a small hotel room. Not bad for a change. But that is almost all what the city had to offer. Looking for a restaurant to have dinner in the evening proved to be a challenge. Except for some fast food restaurants, there was nothing really appealing. At least there were many Chicken grills around. And as we had an apartment, we decided to eat “at home”. We bought a chicken, tomatoes and cucmbers, fresh bred from the bakery. What a delicious meal! It takes another 140km to get to Mashhad. Will we be able to get that far in one day? At least the wind came from the west, which meant that we had tail wind. Not bad at all! We made very good progress. It was fun to ride like this! At the beginning we followed the freeway, but looking at the map once more we found a less frequented road just nearby. We changed to the other road. What a releave it was, hardly any traffic noise anymore and we could enjoy the beautiful landscape and the nice villages we passed through. After about 6h we arrived in Mashhad, a city with 2.7mio inhabitants. In the meantime we are used to the chaotic Iranian traffic and we drove through the different lanes and circles like locals! Mashhad is the second biggest city of Iran and known as pilgrimage site. More than 27mio pilgrims visit the city each year to visit the shrine of the 8th Imam Reza. The economy of this city relies mostly on these pilgrims. 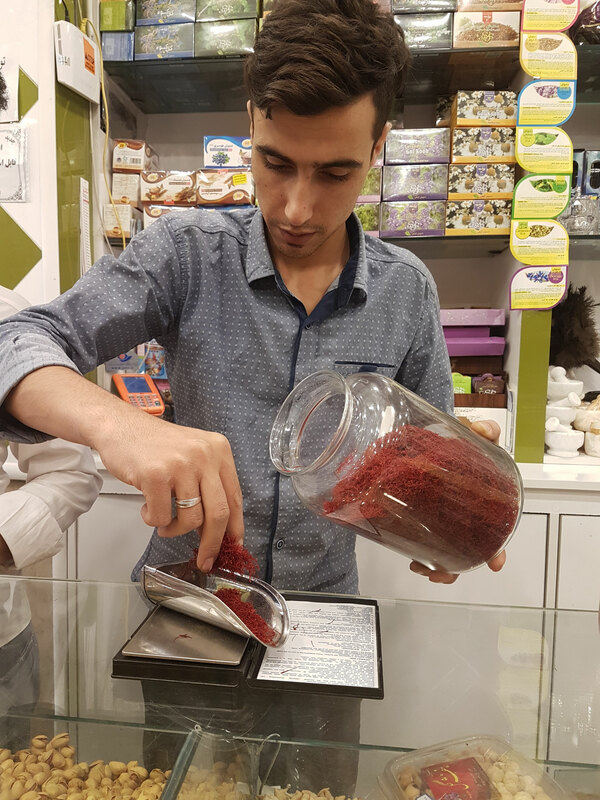 There are countless hotels and shops, taxi drivers, fotographers, souvenirshops… The area is also known for having the best safran. Walking through the streest we have the feeling that every second shop is selling safran and other spices. The way the safran and all spices are presented in the shops is just tremendous. And the smell of it is even better! Of course we visited the shrine several times. The dimension of it (diameter of 1km ) is already beyond words, not even mentioning all the Iwans (towers) incl Clock tower, shrines, courtyards, mosques, mosaics of mirrors, golden dome etc. There is a hive of activity in and outside the shrine. It starts with the entry control. Of cours, women and men have to use different entry points. Women are obliged to wear a tschador. Accordingly the control takes a bit more time, as each women has to “open” the tschador to make shure nothing illegal is brought into the area. Lining up in a way we are used to is impossible. Everyone wants to be the first in the row, using elobows, pushing the others. If you don’t behave the same way you will never get in! Handbags are checked. Cameras are not allowed, as it is forbidden to take pictures of the shrine. On the contrary, handys are allowed inside the shrine. Just imagine, how many selfies and pictures are taken…. Pilgrims are everywhere in the area, whether sitting in a courtyard or inside of one of the buildings, they are sitting on the prayercarpets, reading the Koran, discussing, make phone calls, relax, pray, while children are playing and running around. We experience a lot of emotions: praying believers, pilgrims, who have walked hundreds of kilometres to get to the shrine, embracing each other and crying after all the strain; shiny eyes full of joy and happiness, people with tears in their eyes… We attend an evening prayer after sunset. Praying carpets are rolled out, more and more people arrive, almost all women wear a black tschador, the moment is very special for Markus and me. Outside the shrine, the black colour is omnipresent. The streets are very crouded, especially before and after praying times. As a joke I told Markus to memorize how my tschador looks like, so he can easily spot me in the croud, should we get separated! 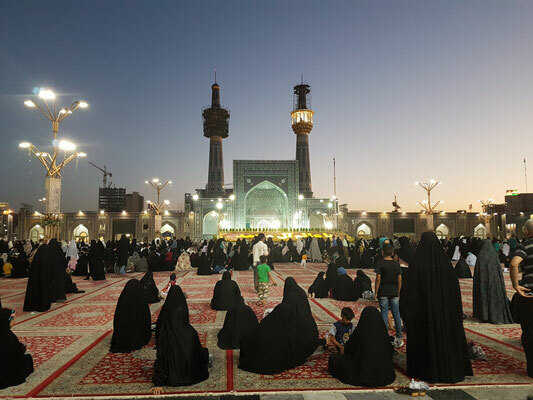 Except of visiting the shrine, there is not much to do in Mashhad. Concerts and other events are forbidden, there are not many museums, and everything is concentrated on the shrine. Therefore we decided to visit Neyshabur to look at the wooden mosque and 2 Shrines of 2 famous Iranian poets. For 2 days we could escape the hectic of Mashhad. Before we contine our trip heading towards Turkmenistan, we take a break of 10 days. There will be no blog until the beginning of September, then we already will have passed Turkmenistan and hopefully reached Usbekistan. Have a good time!